(Left) Sarah Attar, (right) Margo Malone in the living room they will soon vacate. After six years in donated housing, Mammoth Track Club [MTC] athletes will be removed from their condos by the end of April, 2019. 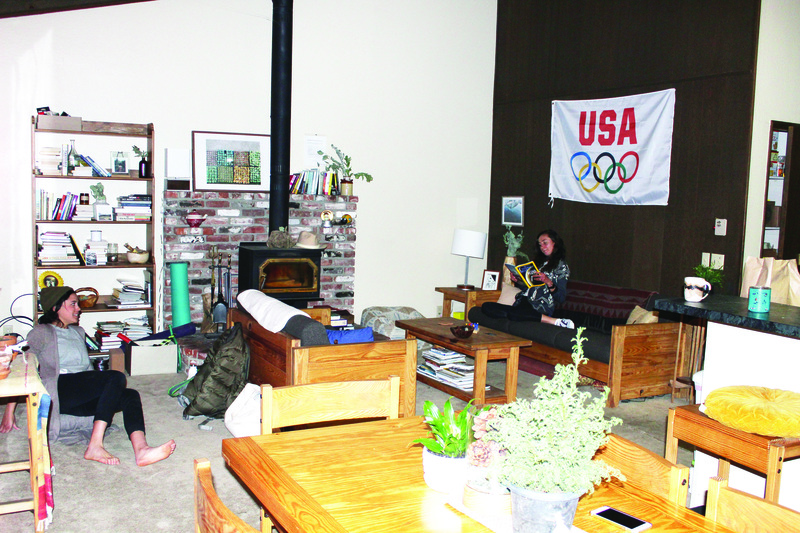 Mammoth Mountain Ski Area (MMSA) has allowed elite athletes from MTC to live in two condos that it owns on Chateau Road free of charge for the last six years. Now housing concerns have led the mountain not to renew its donation. MTC Board President Deena Kastor expressed her appreciation for the mountain’s backing. “We are so grateful for Mammoth Mountain and the support they have given the club since its inception in 2001. With the housing crisis, it is no surprise that the Mountain is in need of reacquiring the two condos it has generously given our professional runners so it may house its employees,” Kastor said. The loss of free housing represents a serious blow for many of the athletes in the track club. “This upcoming change has forced our athletes to reconsider their careers, their ideal housing possibilities, and has forced us all to get creative,” Kastor said. According to a survey of 312 athletes at the 2013 USA Track and Field National Championships, the majority of elite distance runners make less than $20,000 annually. In a sport where much of the revenue is consolidated with the top few athletes, charitable support is necessary for developing the world-beaters of the future. Many MTC athletes, even those who have represented their nation on the world stage, have had to work part-time jobs in order to continue to compete. Sarah Attar has been with the MTC for 4 years. In 2012, she became the first female athlete to represent Saudi Arabia at the Olympic Games when she qualified to run the 800 meters. At the 2016 Olympics, she represented Saudi Arabia in the marathon. Attar moved to Mammoth to be a part of the Mammoth Track Club. “Mammoth is the best place I can imagine for my running,” she said. Attar has held part-time jobs at the Hayden Cabin Museum, the Twin Lakes Art Gallery, Stellar Brew, and she now works at InTouch Spa. Margo Malone first came to Mammoth on a training trip here with the Boston Athletic Association, another pro club. She fell in love with the location, and left her old group in Boston to join MTC. Like Attar, Malone works a part-time job and relies on the subsidized housing to continue her competitive career. “I couldn’t have moved here without the condo option,” Malone said. Mammoth Lakes Tourism [MLT] has branded Mammoth as, “California’s Endurance Playground.” The Eastern Sierra will host 35 unique endurance events between February 2019 and January 2020, from Nordic ski races to marathons to triathlons. Since 2011, MLT has also sponsored, “The Crib,” housing for, “elite athletes interested in coming to town to tap into the perks of high-altitude training.” The Crib is just for visiting athletes and not available for MTC athletes. MLT began supporting the MTC in 2001, just before locals Meb Keflezhighi and Deena Kastor won silver and bronze medals at the 2004 Olympics. “We currently sponsor the track club at $30,000 a year because we consider it the crown jewel of our endurance program,” said MLT Director of Communications Lara Kaylor. Kaylor said that having elite athletes call Mammoth Lakes home is good for the town’s brand. MLT Events Director Caroline Casey has seen first-hand the exposure that Mammoth’s elite athletes have given to the town. Flanagan is not a member of the Mammoth Track Club, but does her altitude training here. The main reason why great American marathoners like Meb Keflezhigi, Ryan Hall, and Deena Kastor have all based their training in Mammoth is the town’s geography. At roughly 8,000 feet above sea level, the thin air of Mammoth causes the bodies of athletes who live here to produce more red blood cells, thereby allowing their blood to carry more oxygen to their muscles. This high altitude alone is not what makes Mammoth special, however. Mammoth’s draw for elite distance runners is its high altitude combined with its proximity to low altitude. Athletes from MTC travel to Bishop for their runs in the winter to get out of the cold and to be able to train in the thicker air. “Live high, train low,” is a common adage among endurance athletes. Athletes need to perform their hard sessions in an environment with more oxygen so that they can push their bodies to the extremes that replicate competition scenarios. The discontinuation of Mammoth Mountain’s donation shows how the housing crisis affects Mammoth Lakes viability as a training location for elite endurance athletes. More welcoming housing markets give towns like Flagstaff a leg up on Mammoth. The average rent for a 2-bedroom apartment in Flagstaff is $1,129 per month according to an Arizona Housing Coalition report from 2018. According to the Mammoth Lakes Community Housing Action Plan of 2017 [CHAP], the average rent for a two bedroom in Mammoth Lakes was $1,300, approximately 15% higher than in Flagstaff. Blaise Ferro, a distance runner at Northern Arizona University in Flagstaff, said that the Flagstaff housing is affordable. Northern Arizona has won the last three consecutive NCAA team titles in cross-country, and has produced some of the best distance runners in the United States. Ferro said that he and his teammates live off-campus, and each pay between $300-$500 a month in rent. MTC Coach Andrew Kastor doesn’t know what his athletes will do once they lose their housing in April. “Right now, Deena and I, along with the Mammoth Track Club Board of Directors, are looking into housing options for each of our athletes. Ideally, we’d like to keep each team member in Mammoth Lakes and in a supportive training environment. We’ll be reaching out to our Mammoth Track Club Adult membership shortly to inquire about any opportunities that may exist in opening up their homes to a well-behaved and driven elite distance runner,” Kastor said. Coach Kastor has asked that anyone reading this article with a passion for elite athletics and a desire to help the club should reach out to he and Deena at https://www.mammothtrackclub. com. Few locations in the U.S. have this desirable combination. Athletes in Park City Utah can live at 7,000 feet and drive 40 minutes to be at 4,200 feet in Salt Lake City. Similarly, Flagstaff, Arizona at 6,800 feet is a 45 minute drive from Sedona at 4,350. Flagstaff and Park City are popular destinations for the elite endurance athlete, but Mammoth leads the pack with the highest highs in proximity to the lowest lows.